Create a legacy SOAP XML web service server app, and a separate client app that can work with a SOAP XML web service. This is the final assignment in the fall academic term. Demonstrate that you can interact with a web service, using two different kinds of clients. Adapt an existing and working modern web service app, by adding a legacy SOAP XML web service. Then, create a new web app, which will act as a client app. It will be able to call into a legacy web service. Every week, in the computer-lab class/session, your teacher will record a grade when you complete a specific small portion of the assignment. We call this “in-class grading”. Next, create a new ASP.NET Web Application, as an MVC web app, with no user authentication/security. We suggest that its name will be “Assign12Client”. Personalize the Index view of the Home controller with your own name etc. 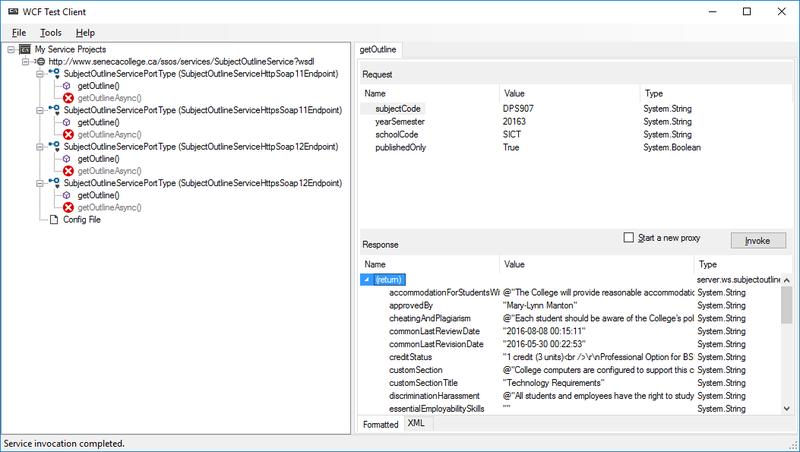 As noted above, you can use the professor’s Assignment 5 sample solution as the base for your server app. Read the specifications again to refresh your memory about its purpose and functionality. Build/compile, then run the app to ensure that it works correctly. Test with Fiddler. Personalize the Index view of the Home controller with your own name etc. In the interface – IA12Service – declare methods that implement the use cases. We suggest that you use method names that are similar to what is found in the Manager class (e.g. CustomerGetAll(), CustomerGetById(), etc.) That way they will show up together – alphabetically – on IntelliSense and other lists. Make sure that you use that technique for the methods that need model validation. Test your work on Assign12Server by using the WCFTestClient.exe program. This section will be done by WSA500 students. Now, work with the Assign12Client web app project. Use the technique you learned in this week’s notes to add a service reference, to the “server” app that you created above. We suggest that the “Namespace” name be something short and noticeable, maybe “Chinook”. The methods will call out to the SOAP XML web service, and return an object or collection (or null). 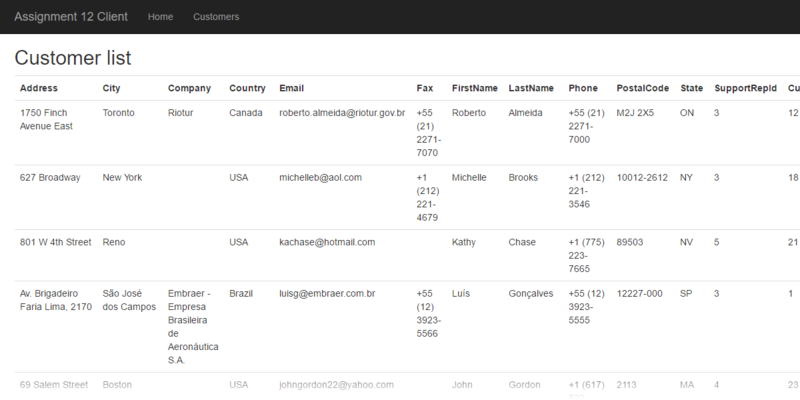 Next, create a Customers (MVC web app) controller. Implement its “get all” and “get one” methods, with views. Add a link to the list-of-customers resource to the app’s menu. Here’s what the “get all” view looks like. Click an image to open it full-size in a new tab/window. The first image was generated by the view scaffolder. The second image shows the result of some view editing, to group and gather some related information together, to produce a more readable result. Here’s what the “get one” view looks like. The first image was generated by the view scaffolder. The second image shows the result of some view editing, to group and gather some related information together, to produce a more readable result. This section will be done by DPS907 students. The modern web services will deliver data about courses in academic programs that are offered by the School of ICT. The legacy web service will deliver an official course outline for a specific course, selected from the data that’s returned by the modern web service. 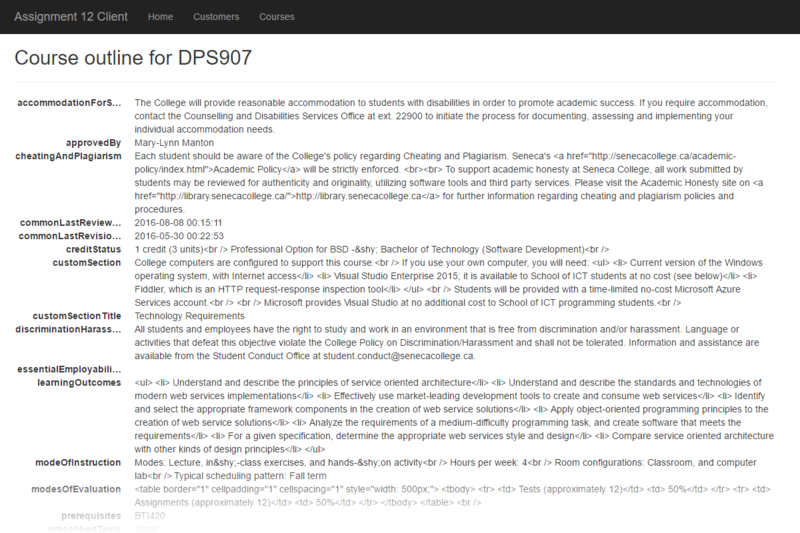 The School of ICT is in the process of building a public API. The future (near-term) vision is that it will deliver hypermedia representations of assets that will be useful to the School of ICT community (students, faculty, and admin staff). 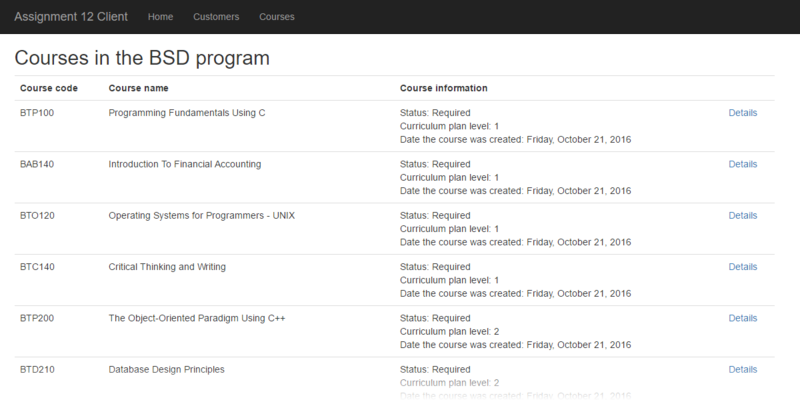 Next, create a Courses (MVC web app) controller. Implement its “get all” method, with view. Add a link to the list-of-courses resource to the app’s menu. We will need the scaffolded Details hyperlink, but not the Edit or Delete hyperlinks. The College has a system that maintains official course outlines for all courses offered, at all campuses, by all Schools (academic service organizational units). The system provides data to many other systems, including the College’s public web site. Its data can be accessed by a browser client (for rendering in a browser), or by an HTTP client (for whatever it wants to do), through a public web service. For your information only, the academic term code is a string. The year is its first four digits. The last digit is 1 for winter, 2 for summer, and 3 for fall. So, the Fall 2016 academic term code is “20163”, as a string. 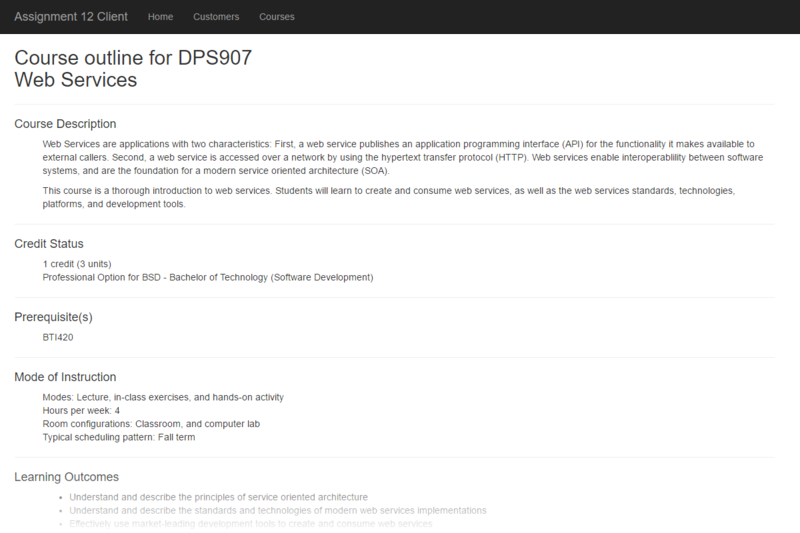 If you look at the course outline for this DPS907 course, as published on the School of ICT web site, you will notice lots of text content, including course description, credit status, topic outline, and so on. Most of the text content is HTML. The page is built by calling the legacy web service, and then pouring the data into containers (<div> elements) on page that matches the formatting of our School of ICT web site. This is the task that you will do – call out to the legacy web service, and render the returned content into an ASP.NET MVC web app page. How can you get started? First, you will need the URL to the web service’s WSDL document, shown below. You can use a browser to view the document, and of course you will need the URL to complete the next step. The “add service reference” task creates four (4) “bindings” for different ways to contact the web service. These are added to the Web.config file, near the bottom. We need only the first one, named “SubjectOutlineServiceHttpSoap11Endpoint”. Comment out (or remove) the other three. The resource model for the course outline object was created by the add-service-reference task. In the Manager class, add a method that will accept a course code parameter, and use it to call out to the SOAP XML web service, and return a course outline object (or null if not found). Enclose the call in a try-catch statement. What does it mean if the call returns null? It means that the course does not have a fall-term outline (i.e. academic term code 20163). For example, BTI420 is a winter-term course. It does NOT have a fall-term outline. 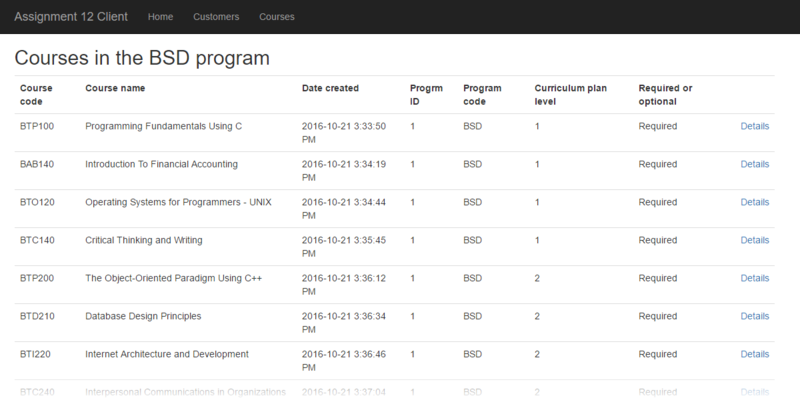 Next, in the Courses (MVC web app) controller, implement its “get one” method, with view. The view’s “Model class” will be the SSOS namespaces’s SubjectOutline class. Important notice: Many of the values in the SubjectOutline object are stored as HTML text. If you attempt to render this content on a view, the Razor view engine, as a safety feature, encodes the text content. The result is that you will see angle brackets. Fixable? Yes. How? Render the value by using the Html.Raw() helper, instead of Html.DisplayFor(). Here’s what the “get one” view looks like. Click an image to open it full-size in a new tab/window. The first image was generated by the view scaffolder. The second image shows the result of some reorganization activity, to produce a more readable result. If your client app works correctly, then your work has been tested. For this assignment, we do NOT use Fiddler. This Assignment 12 has a modified submission process (and is similar to the process for the previous Assignment 11). We need both projects to be able to grade your work. For example, assume that you are currently viewing a folder named “A12” in File Explorer. Select both folders, then zip them into one zip file result. If you have errors when attempting to use the SSOS service, the following information may be useful. 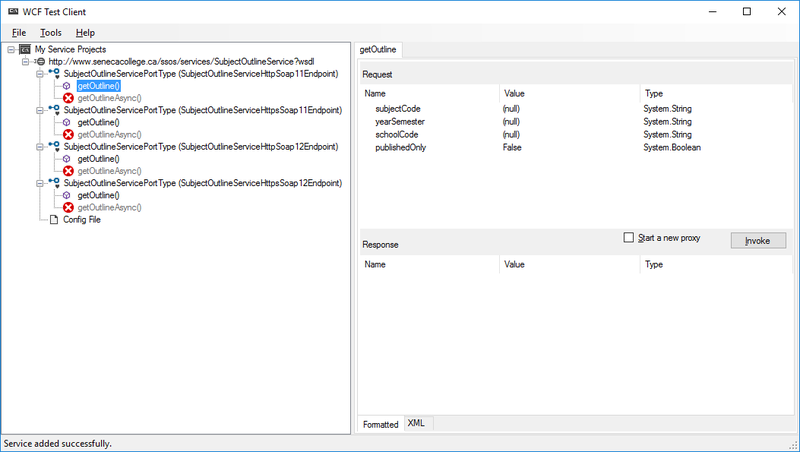 Use the debugger to inspect the data that you pass to the “getOutline” method call. Alternatively, you can use the “WCF Test Client” app to interact with the SSOS service. "c:\Program Files (x86)\Microsoft Visual Studio 14.0\Common7\IDE\wcftestclient.exe"
After it loads, you will see four bindings. Similar to what you noted earlier, we are interested in the first binding. Double-click its “getOutline()” method. 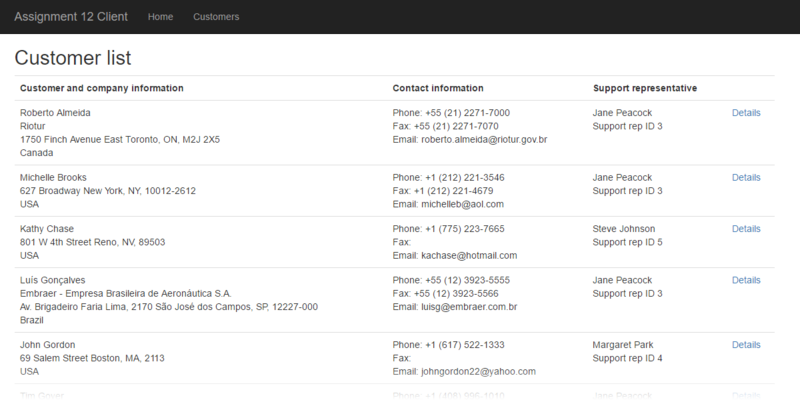 On the upper-right “Request” panel, you will see the data items that you must send. Fill in the data, and click the Invoke button.